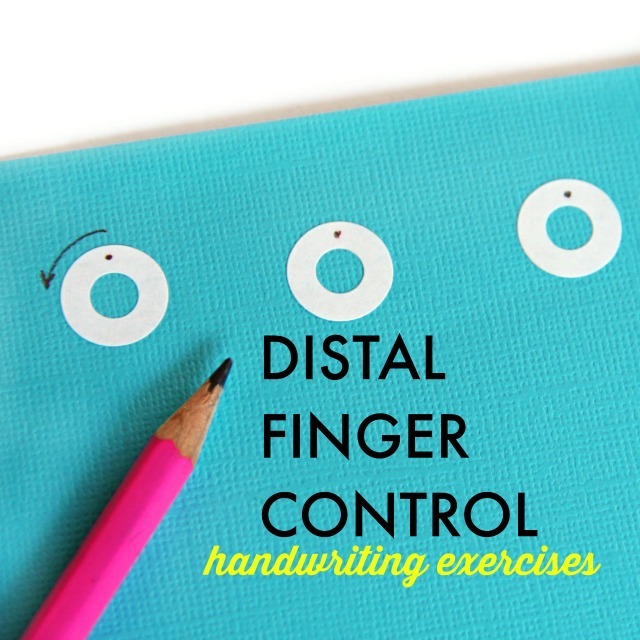 Distal Finger Control is a fine motor skill exercise in dexterity that is needed for manipulating the pencil with the fingers. Without distal finger control, a child uses wrist and forearm motions to move the pencil, form letters, and write with larger pencil strokes. Those bigger pencil lines tend to be less controlled and can result in legibility issues, spatial awareness difficulties, and line awareness troubles. Helping a child to improve their distal finger control is one way to help improve handwriting. There are many ways to encourage motor movements of the digits vs. using larger muscle groups. Opening of the thumb web space, finger isolation, pincer grasp and pinch grip strength, intrinsic muscle development, thumb IP joint flexion, and arch development are key to ensuring functional use of the distal fingers in tasks like handwriting. This simple activity is one way to develop distal finger control for use in manipulating a pencil. Below, you'll find more ideas that can be used as well. Have your child stick the labels to a piece of paper. A colored piece of paper like cardstock is perfect for it's bright and bold colors. Peeling the stickers is a great way to encourage fine motor development of neat pincer grasp. Next, draw a small dot on the top of each reinforcement label. You can add a curved arrow pointing from the dot and going counterclockwise. Show your child how to place their forearm and wrist on the table surface (a slanted surface would be better!) and to use one pencil line to make a circle while staying inside the white boundary of the reinforcement label. 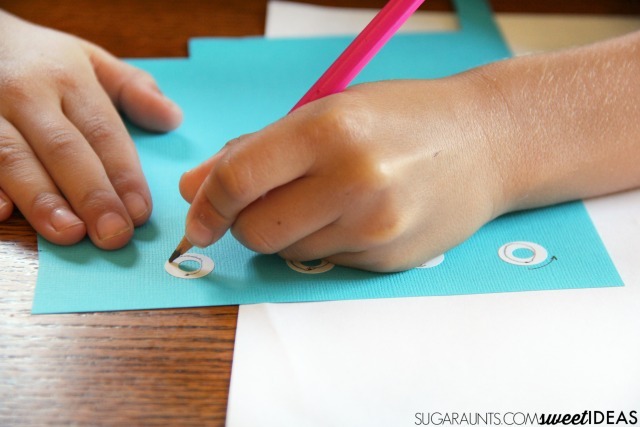 Fill a whole page with reinforcement stickers and work on producing circles in the counter-clockwise direction while staying inside the boundaries of the label. To grade up this activity, try a timed test. Turn on a timer and see if the child can stay in the line of the label while using only their fingers to draw the line. You could also use these brightly colored neon paper reinforcement labels for a pre-colored and high contrast label for practicing motor control exercises. Each of these toys and games can be turned into distal finger control exercises by adding a timed component. Try to encourage your child/student/client to perform the activity with their forearm and wrist on a table surface and "beat the clock" to complete the muscle building activity for longer and longer time periods. How can you make these "exercises" a fun part of therapy or a pre-writing task? I would love to hear your ideas! Shoot me an email at sugaraunts@gmail.com or respond in the comments below! Looking for more ways to use page protectors in therapy? 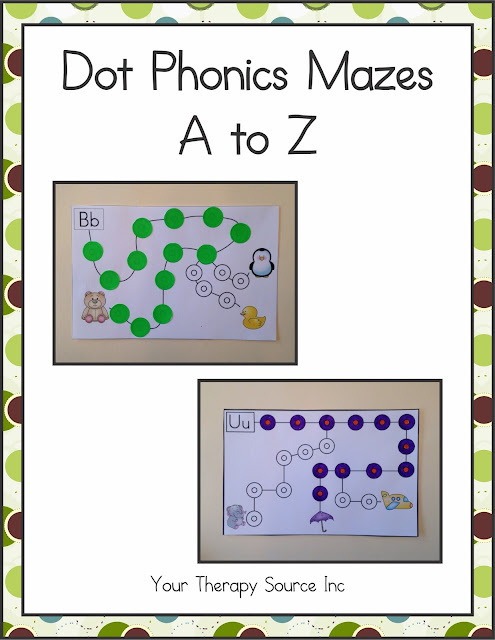 I love these Dot Phonics Mazes for their fine motor and visual motor integration work. Peeling and positioning the stickers onto the lines requires a coordinated effort of visual processing and fine motor dexterity. This packet of printable puzzles would be a great addition to the therapy clinic or home/school setting. Kids love hands-on busy work like this and when a maze is involved it is even more fun. By completing the mazes, they are building visual skills such as visual scanning which is essential for reading and writing. Add this activity to your therapy tool box! This activity is part of our month-long handwriting series where we are sharing creative and easy ways to address common handwriting issues in our 30 Easy Quick Fixes for Better Handwriting series. You'll also want to join the Sweet Ideas for Handwriting Help Facebook group where you can find support and resources for handwriting.